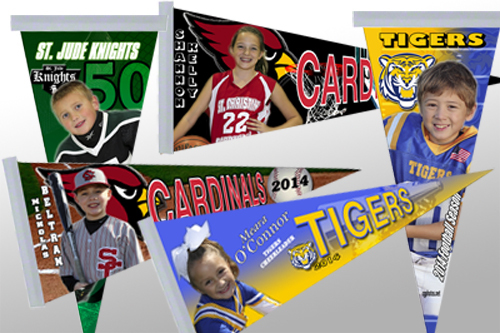 is with our custom sports pennants. 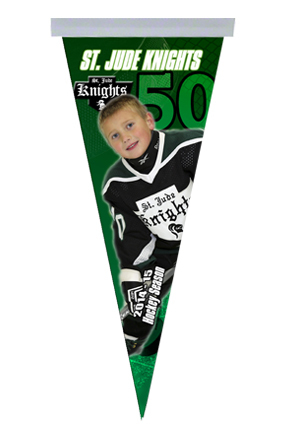 These 5" x 12" pennants are made of felt and come custom made. We can design to suit your sport team, event or fun raiser with custom graphics and logos. 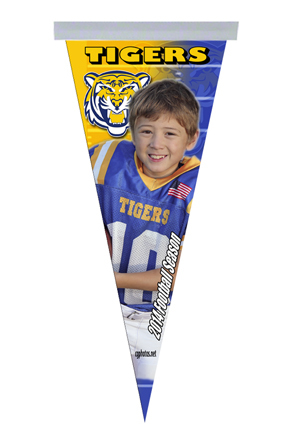 These pennants come with players name. High impact basketball graphics, team name and logo. These pennants come with players name. High impact baseball graphics, team name and logo. These pennants come with players name. High impact cheer graphics, team name and logo. These pennants come with players name. High impact football graphics, team name and logo. High impact hockey graphics, team name and logo.